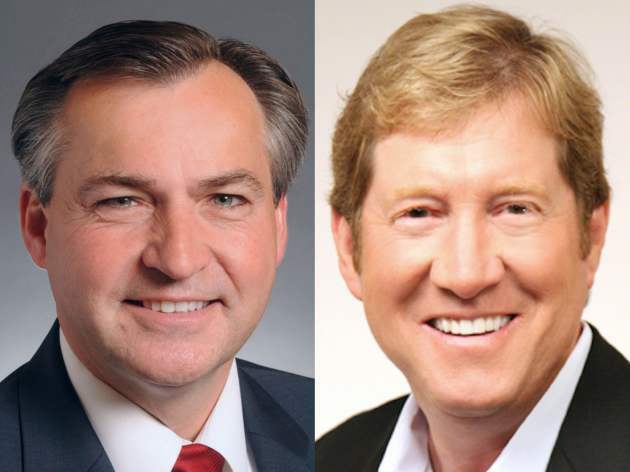 Former state Senator John Howe and former radio show host Jason Lewis, sparred over abortion rights during last evening's debate in Cannon Falls between the Republican candidates for Congress in Minnesota Second Congressional District. Responding to a question asked of all candidates about defunding Planned Parenthood, Howe said he was always opposed abortion, but said Lewis supported abortion rights when he ran for Congress in Colorado. "Jason Lewis is now running in Minnesota [Congressional District] 2 and he wants to say that he’s considered pro-life," said Howe. "Well he ran before in [Congressional District] 2 in Colorado and he suggested that most people would consider him pro-choice," added Howe. "26 years ago, I told somebody I believed life begins when the heartbeat begins, and somebody said 'you must be pro-choice,'" said Lewis. Lewis ran for Congress in Colorado's Second Congressional District in 1990, challenging Democratic Rep. David Skaggs. Skaggs defeated Lewis, winning over 60 percent of the vote in the general election. In an interview with the Denver Post from May 1990, Lewis was asked about his position on abortion. Lewis answered, "While most people consider my position pro-choice, I'm opposed to public funding and support parental notification." Lewis’ campaign released a statement this morning, which said, "Jason is pro-life and believes life begins at conception," adding Lewis "will stand staunchly in defense of innocent life as a member of the United States Congress." Howe said this morning that Lewis was wrong for supporting abortion rights. "For someone who adopted the stage name of ‘Mr. Right,’ Jason certainly hasn't been right on the issue of protecting the life of the unborn,” said Howe.